Draw in Photoshop and other art programs with this display. It's not without its flaws, but XP-Pen's latest drawing tablet delivers a true-to-life drawing experience at a reasonable price. Only a few years ago, the idea that every digital artist could afford technology that enabled them to draw directly on to their screen was fanciful. Today, we not only have iPads and Android devices that provide this facility, but the options for artists on desktop and laptop computers have greatly increased. 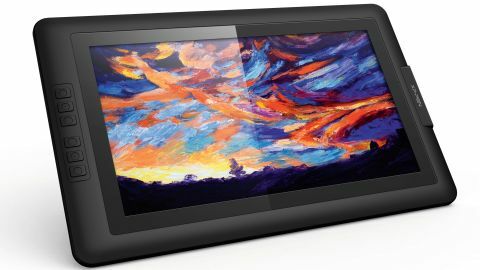 The newest XP-Pen Artist 15.6 drawing tablet is a case in point. It's a generously sized 15.6-inch screen that costs just under £400. The days when you had to sell your car to afford a Cintiq are over. Nor are there any apparent compromises that make the XP-Pen Artist 15.6's competitive price possible. Open the classy packaging and you're greeted with a slim but solid flat panel, with six shortcut keys down one side. Pleasingly, you can rotate the display orientation to position the keys to suit right- or left-handed use. Setting up the XP-Pen Artist 15.6 is a little involved, but you only need to do it once. The cable connecting your computer and the tablet uses a single USB-C port to plug into the tablet. At the other end, though, is a multi-headed hydra of leads: one HDMI to feed the video (an adaptor for Mini DisplayPort is provided); one USB to relay the pen information; and a second red USB to provide power. If you own one of the small but growing number of laptops that use USB-C, you'll need an adaptor to plug in the XP-Pen Artist 15.6. Note: if you use a USB-C MacBook Pro, then the Digital AV Adaptor you need is a hefty £69. You also need to install drivers, either from the provided CD or via the XP-Pen website. This includes a tool for calibrating the stylus and configuring features. It's worth noting that the Windows tool offers more options than the Mac OS equivalent. The screen itself has a matte surface. The picture isn't as bright or colourful as you'd get from a glossy screen, but its surface is better for drawing on: it has more 'bite'. And drawing and painting on this tablet is a pleasure. The screen size frees you up to make expressive brush strokes, and the pen pressure sensitivity is responsive enough to keep your lines flowing. The XP-Pen Artist 15.6 isn't perfect. There's no stand included for people who prefer to draw at a slight angle; and there's a little too much visual offset between the point of the stylus and where the cursor appears on-screen. You get used to it when painting, but it makes precise work trickier. Yet these are really quibbles within the context of having an expansive drawing surface on a decent-quality screen, for relatively little outlay. The XP-Pen Artist 15.6 can transform your digital art experience for the better. This article originally appeared in issue 159 of ImagineFX, the world's leading magazine for digital artists. Buy issue 159 or subscribe here.